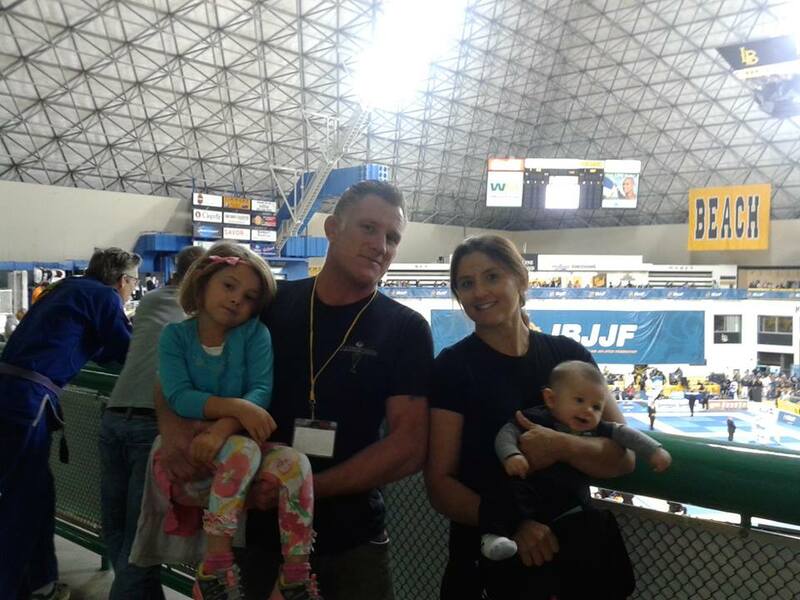 First degree black belt Melissa Haueter is a mom of two young kids, the owner of Expanding Abilities Tutoring, and the wife of Dirty Dozen’s Chris Haueter. She is lucky to have a gym in her back yard, The Garage, where she teaches and trains! She will be travelling to Minnesota in March to teach a women’s bjj seminar at Minnesota Kali Group. Don’t miss the opportunity to train with her! Tell us a little bit about yourself? How did you get started, and what is your most memorable achievement so far? My first real experience with jiu-jitsu was learning a guard arm bar in the one car garage of the home I now live in. In February of 2003, I met this cute guy with strange mangled ears named Chris Haueter. On our third date, he cooked dinner for me, and gave me my first jiu-jitsu lesson. After that, I started attending his classes at South Bay Jiu Jitsu in Hermosa Beach, and Centerline Gym in Bellflower, and was soon taking private lessons from Cindy Omatsu as well as attending her classes, and open mats at the Machado Academy in Torrance. I’d say I became addicted to training pretty quickly. I was somewhat awkward on the mat, and had a hard time learning techniques as I had never participated in any sports growing up, and I was pretty out of shape when I began. Chris teaches seminars around the world, and I’ve had the good fortune of being able to travel with him, and train in Singapore, the United Kingdom, South Africa, and around the US. We did a lot of traveling when I was a blue and a purple belt, and I feel that this really helped to shape my game. As a brown and a black belt, I’ve spent time training at Let’s Roll in Torrance, and Alliance Los Angeles. In 2005, we converted our back garage into a mat room, and I spend a lot of time there drilling, teaching, and sparring. Right now, I am solely training in The Garage as I have a five month old baby, and I don’t like to leave him for too long. I am able to set the little guy up on the side of the mat, and train until he fusses. Besides the births of my children, there is one achievement that stands out among the rest. I struggled to become an athlete as an adult, and I did a lot of competing at blue and purple belt level. I had a hard time with nerves, and had to learn how to be a good sport. In 2008, I competed at the No-gi Worlds, and I had a great day. I was relaxed; went out, and played my game. I won 3 matches in my division to take the gold. The last match was a submission in under two minutes. I also won my first match in open class and took third place. This was and still is my best day of competing in a major tournament. I was at a low point in my life when I began training, and jiu-jitsu was part of the solution for me. I had something to focus on besides the drama that was going on in my life. I faced many challenges in the years that followed but what stands out in my mind is my journey through the brown belt. A few months after receiving my brown belt, I injured my knee while preparing to compete at the Pans. Shortly after, I became pregnant with my daughter, and my whole life suddenly took a tremendous shift. I had a hard time adjusting to motherhood. I went from working more than full-time, and training 6 days a week with regular competitions to being responsible for another human being, and having to put some of my personal goals on hold. I decided that I would put competing out of my mind until my daughter Alison was one. In 2011, I cut weight to 114 pounds by pretty much starving myself so I could compete at light feather in the brown/black belt division. I was also training multiple times a day. I did this as I was weaning my daughter from breastfeeding, and undergoing some huge hormonal changes. Needless to say, I was pretty crazy; my husband and I were at each other’s throats. I was at a bottom, and my addiction was jiu-jitsu. I had to get help. I took some time away from competing but I continued to train a few days a week. I had to work on my mental relationship with jiu-jitsu. Jiu-jitsu is an outlet for me. It is not only a hobby but a passion. If I’m not enjoying it, and it’s not enhancing my life, I’m doing something wrong. One of the main challenges it presents to me is a continuous release of my ego. I had to learn not to compare my experience with jiu-jitsu to other people’s experience as each person has their own journey. I learn from each session, and strive to keep balance in my life. It is a practice of knowing when to be a student, and when to be a teacher; when to train, and when to take a day off, and to remain humble in all my interactions with people I meet on the mat. I got my priorities in order, and I think that my relationship with jiu-jitsu is now much more balanced. I was able to train and compete in both the Pans and Worlds in 2013, and my experience was so much more relaxed and fun. What advice would you give to women who have a hard time in training and consider quitting? My advice would depend on what specific challenges the woman is facing. If a woman is feeling unsupported by her team mates, I might advise to look for a more supportive male coach or a gym that has a few solid female grapplers. I really benefitted from training with Cindy, and her group of women. Cindy understood what it was like to be one of the smallest people on the mat and taught me how to use technique over strength. I definitely feel that jiu-jitsu is not for everyone. I always ask my students why they want to learn jiu-jitsu. If the answer is to get in shape, I tell them that there are easier ways to get in shape. Learning and practicing jiu-jitsu is challenging, and that is what I love about it. It pushes me physically, mentally, and emotionally. With each challenge that I face comes growth to a new level. 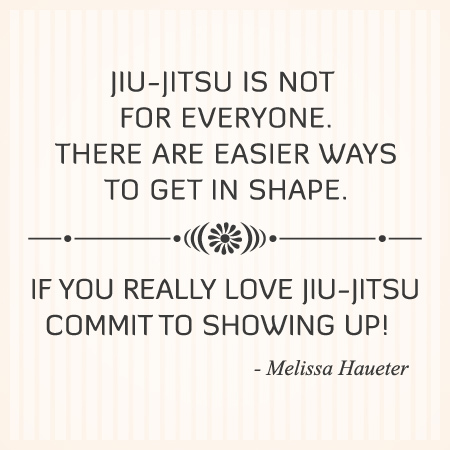 For any woman who loves jiu-jitsu, and can’t imagine her life without it, I say make time for it, and commit to showing up! Become friends with some of the people you train with, and turn to them for support when you need it. EXCELLENT Interview! Melissa Haueter is my coach and friend. She is an exceptional instructor, hilarious human being and a BADASS on the mat! It is a honor and privilege to train with her! Great story and well-written…Haueter is inspirational and on point.